*Please note: Pricing per side. Two Units are required to make a link. There are two airFiber models available for the 5 GHz spectrum. The model, AF5, features the popular mid-band frequencies, which are freely used in many parts of the world. The high-band model, AF5U, which can operate in the 5.7 - 6.2 GHz bands, has robust filtering to enable co-location with devices operating in the lower 5 GHz bands while allowing operation at a higher output power in many areas of the world. Introducing airFiber, a truly revolutionary Point-to-Point wireless platform from Ubiquiti Networks™. Housed in a compact, highly efficient form factor, airFiber delivers amazing wireless gigabit+ performance, low latency, and long range. airFiber ushers in a new era in price-disruptive wireless technology ideal for carrier backhaul, building-to-buildingenterprise use, or public safety applications. Every detail of airFiber was designed and engineered by the Ubiquiti R&D Team. From the silicon chip up to the innovative split-antenna architecture, the Ubiquiti R&D Team created airFiber to deliver superior throughput with efficiency. 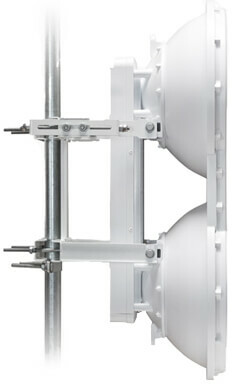 airFiber was pupose-built to create a high performance backhaul. 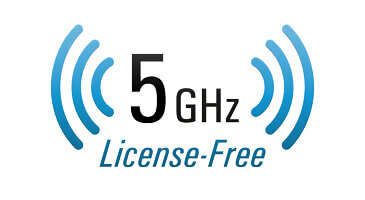 airFiber operates in worldwide, license-free 5 GHz frequencies. Anyone around the world can purchase and operate airFiber without any special permits, paperwork, or added licensing costs. Users are free to locate, deploy, and operate airFiber practically anywhere they choose (subject to local country regulations). 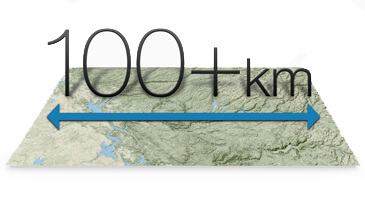 airFiber is built for long-range use: up to 13+ km for airFiber AF-24, up to 20+ km for airFiber AF-24HD, and up to 100+ km for airFiber AF-5/AF-5U, which launches the innovative xtreme Range Technology (xRT) feature. airFiber backhauls do not share the security risks associated with wired backhauls. The long distances of wired backhauls are vulnerable to copper theft, fiber optic damage, vandalism, and accidental breakage. With airFiber, only the installation points of the airFiber links need to be secured. 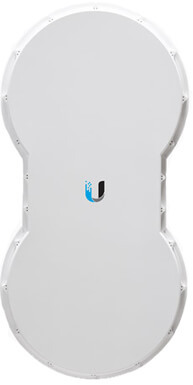 Ubiquiti's innovative proprietary modem technology was purpose-built to address the specific challenges of outdoor, PtP (Point-to-Point) bridging and high-performance network backhauls. Every aspect of the radio has been carefully simulated and designed to optimize range, speed, and latency performance in the harshest RF noise environments. 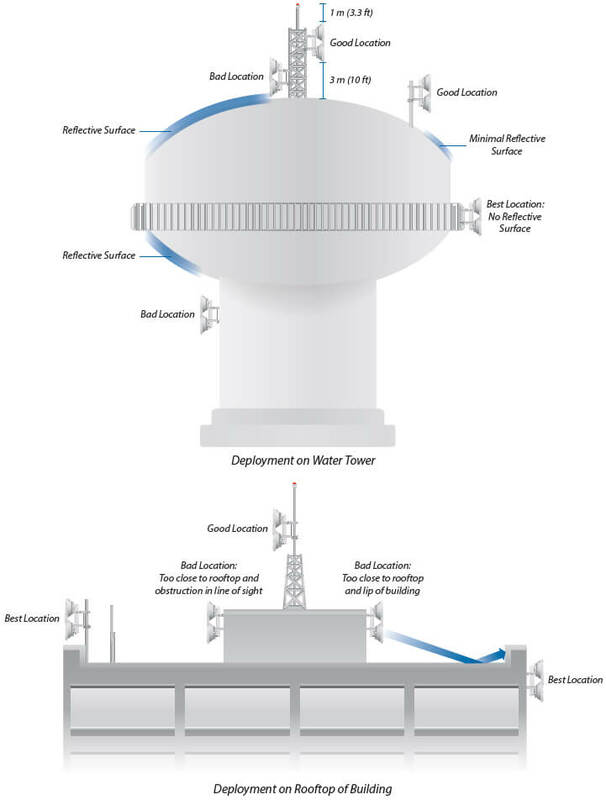 airFiber features a dual-independent, 2x2 MIMO, high-gain reflector antenna system. Separate transmit (TX) and receive (RX) antennas help extend link budgets by eliminating the extra RF losses caused by the switches or duplexers required in systems with common TX/RX antennas. Each airFiber radio has two complete antenna systems and a mechanical back-plane that are constructed as a one-piece "monocoque" molding – a radical departure from industry practice. "Monocoque" means that the exterior skin supports the structural load of airFiber hardware. Due to its single-piece, injection-molded architecture, airFiber adds lightness in weight and affordability to its list of advantages. Network management options - A choice between the greater security of out-of-band management and the convenient of in-band management. SNMP support - Full SNMP support to aid in network management. Local and remote airFiber status information - Available on the Main tab of the airFiber Configuration Interface. 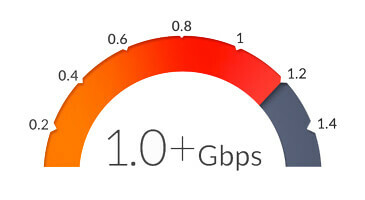 Surpassing conventional wired backhauls, the airFiber 5 delivers real throughput of up to 1.0+ Gbps. 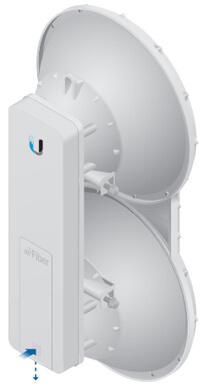 Designed to be a high-performance backhaul, the airFiber 5 performs at a range of up to 100+ km. The airFiber 5 supports FDD (Frequency Division Duplexing) in full-duplex mode for < 1 ms latency, resulting in increased efficiency for carrier-class network backhauls. 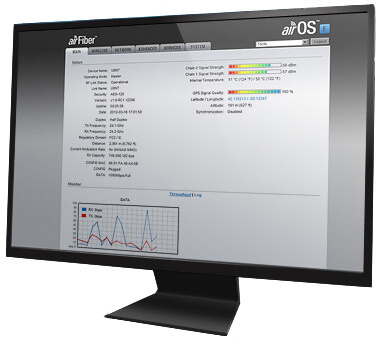 The airFiber 5 operates in worldwide, license-free, 5 GHz frequencies. Users can deploy airFiber5 almost anywhere they choose (subject to local country regulations). airFiber core networks backbones can be instantly and cost-effectively deployed anywhere, bringing Internet deep into the unserved areas of the world. 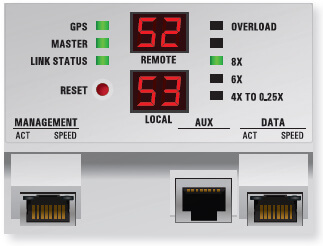 The airFiber AF5/AF5U, referred to as the AF5 in this Design Guide, features unique functionality that requires you to be cognizant of the installation environment. For best performance, you must install the AF5 as high up as possible, with a line of sight free from obstructions. This is especially true in FDD (Frequency Division Duplexing) mode, as there is a requirement to maximize channel/spectrum reuse. Any objects in front of or near the front of the AF5 can have a significant impact on overall performance. 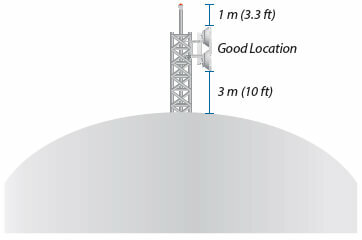 The AF5 should be installed 1 m (3.3 ft) below the highest point of the structure to reduce the risk of a lightning strike. 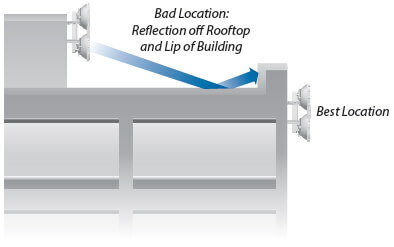 When the AF5 must be installed above a metallic surface like a corrugated flat roof or water tower, then you should ensure that the AF5 is located more than 3 m (10 feet) above the metal/reflective surface. FDD will be most useful in situations that have plenty of spectrum available and will show the greatest benefit on shorter-range links. For optimal performance, you should plan out channel pairs that have maximum frequency separation. Since the AF5 uses sophisticated data processing algorithms and a special antenna structure to eliminate the need for a pre-configured duplexing filter, you should space the 2 duplex channels at either end of the spectrum near the band edges for maximum-range applications. Generally speaking, you can configure shorter-range links for less channel separation between uplink and downlink. You should also use the narrowest channel bandwidth that supports the intended link capacity. This conserves valuable frequency resources and also maximizes link budgets. Ubiquiti Networks™ is currently developing a configuration tool, the airFiber5 Link Calculator*, that will guide you on how to best minimize bandwidth and power/interference based on the specific requirements of your installation. Depending on the country or region, the AF5 may be configured to support maximum transmit power as high as +50 dBm EIRP. Power levels in excess of approximately +43 dBm will start to affect the maximum supported constellation. For example, if you have a relatively short-range link and you need to support a maximum constellation of 256QAM, then configure the AF5 for less than +43 dBm EIRP. To minimize interference, you should use the lowest practical power setting that supports the intended target constellation for a given distance. Looking at the sensitivity values for the given channel bandwidth, you should target a receive signal value approximately 3 to 6 dB higher than the sensitivity threshold. To obtain the greatest range performance, you may want to explore power settings above +43 dBm since the longest-range links will be limited to the lower-order constellations. The best possible range will be achieved with a combination of maximum power level, narrowest channel bandwidth, lowest-order constellation, and TDD. Aim the AF5 using the factory default settings and TDD. Allow the AF5 to automatically rate-adapt. Configure the AF5 for FDD operation. Check the modulation rate and capacity indicators for asymmetry. You may notice significant asymmetry. If you do, then this could be due to a poorly aimed AF5 or an AF5 that is operating in some sort of reflective Fresnel environment. Ensure that the AF5 is correctly aimed and free of any potential reflections before proceeding to the next procedure. Test for a local desense condition (possibly due to a reflection or other disturbance). Begin with the AF5 that is receiving the lowest RX capacity reading, and decrease the TX power on that AF5 by 1 dB. Check if there is any increase in the RX capacity at the AF5. Watch for decreases in the TX capacity of the AF5. Perform step 1 iteratively to find out if there is any RX capacity sensitivity to the local TX power level. Run the lowest transmit power that still allows for the best balance of performance on both ends of the link. This link symmetry procedure should be repeated on the opposite end of the link to test for desense on the other side. For the best possible FDD performance, use as much frequency separation as possible to minimize external coupling of energy. * The airFiber5 Link Calculator will be available as a new tool in an upcoming firmware update. Check community.ubnt.com/airfiber for firmware announcements. Starting with the silicon chip, the Ubiquiti Networks™ Research and Development (R&D) team created airFiber, a sophisticated system robust enough to perform in the harshest RF noise environments. Designed for high-performance backhauls and outdoor, PtP (Point-to-Point) bridging, airFiber AF24 efficiently delivers up to 1.5+ Gbps, aggregate throughput. Systems for millimeter-wave frequencies typically experience RF (Radio Frequency) losses, which occur when part of the RF is lost in the switches and filters. The R&D team eliminated such RF losses, so the link budget is robust and airFiber has better noise figure and higher transmit power efficiency. Designed with two multiplexed transmitters and two multiplexed receivers, the airFiber radio is Zero IF (Intermediate Frequency); it is a direct-conversion radio that generates and decodes the received signal at baseband, so there is no intermediate frequency and virtually no signal loss between the radio and antenna. The R&D team invented numerous algorithms to control the amplitude and phase. The end results are excellent spectral shape and freedom from spurious responses that stem from conversion by-products. The highly flexible FPGA (Field Programmable Gate Array) architecture can be further field-optimized through firmware upgrades. airFiber features both sophistication and reprogrammability; you can add features as they become available and enhance system performance through firmware upgrades. The R&D team created a new MAC (Media Access Control), which is the link between the radio control (FPGA) and physical network. 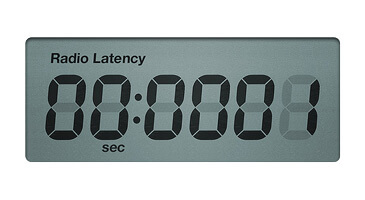 All real-time packet processing is placed in dedicated parallel hardware rather than in software. All real-time functions related to digital signal processing and coding are handled in fully custom hardware that is reconfigurable, so the MAC is extremely powerful while retaining the inherent flexibility of a software-defined system. airFiber incorporates an OFDM (Orthogonal Frequency Division Multiplexing) system to use linear, 2x2, MIMO (Multiple Input, Multiple Output) spatial multiplexing, which has two benefits: enhanced spectral efficiency and the ability to maintain reliable links in poor propagation environments. airFiber automatically scales its modulation based on channel quality but has the ability to be reconfigured from a time/bandwidth perspective to enable the best possible performance in a wide variety of deployment scenarios. The Ubiquiti Networks™ R&D (Research and Development) team created airFiber for outdoor PtP (Point-to-Point) bridging and high-performance network backhauls. The team invented a market-leading, dual-antenna architecture. 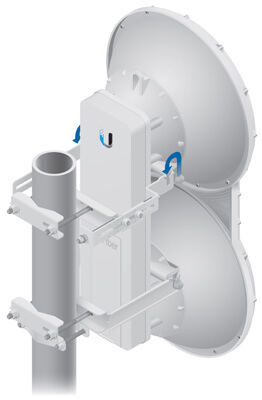 Each airFiber unit features a radical departure from industry practice: a one-piece "monocoque" molding comprising two complete antenna systems and a mechanical back-plane. "Monocoque" means that the exterior skin supports the structural load of the airFiber hardware; this same concept is used to construct lightweight, rigid structures, such as those used for Formula One race cars. Due to its single-piece, injection-molded architecture, airFiber adds lightness in weight and affordability to its list of advantages. 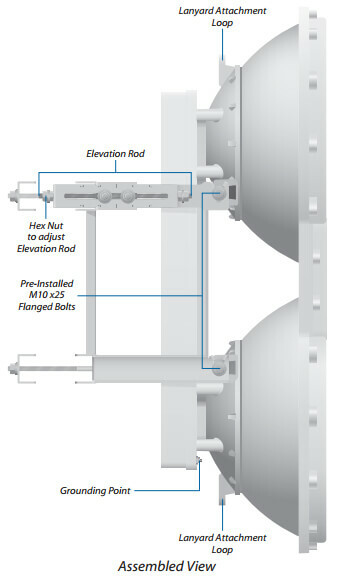 If airFiber had been constructed using conventional methods and individual mechanical parts, collimation distortion (the two antenna beams being skewed with respect to one another) would likely have a negative impact on link budgets and overall system performance. With airFiber's innovative, one-piece assembly, the two antennas can be aimed at exactly the same point in space with a high degree of accuracy and repeatability. 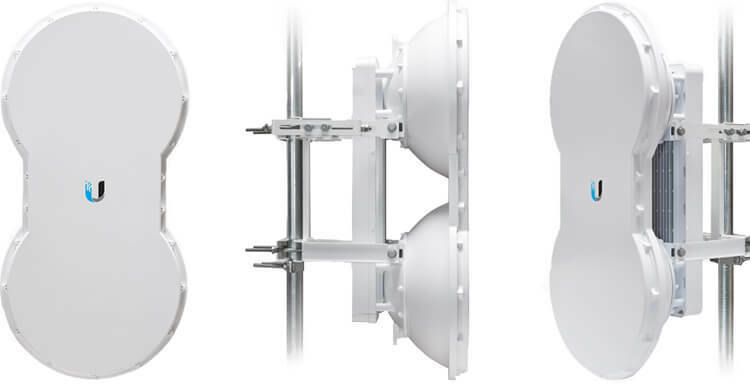 airFiber features a dual-independent, 2x2 MIMO, high-gain reflector antenna system. On each airFiber unit, the smaller antenna on the bottom transmits, and the larger antenna on the top receives. The main lobe of the receiver is more narrow than that of the transmitter, in both azimuth and elevation, so peak performance requires precise aiming and fine-tuning of the alignment between the airFiber units during installation. airFiber’s purpose-built hardware provides superior wireless performance, higher capacity, and lower latency. Unlike standard WiFi protocols, Ubiquiti airFiber’s Hybrid Division Duplex (HDD) provides the best of both worlds — latency performance of Frequency Division Duplex (FDD) with the spectral efficiency of Time Division Duplex (TDD). 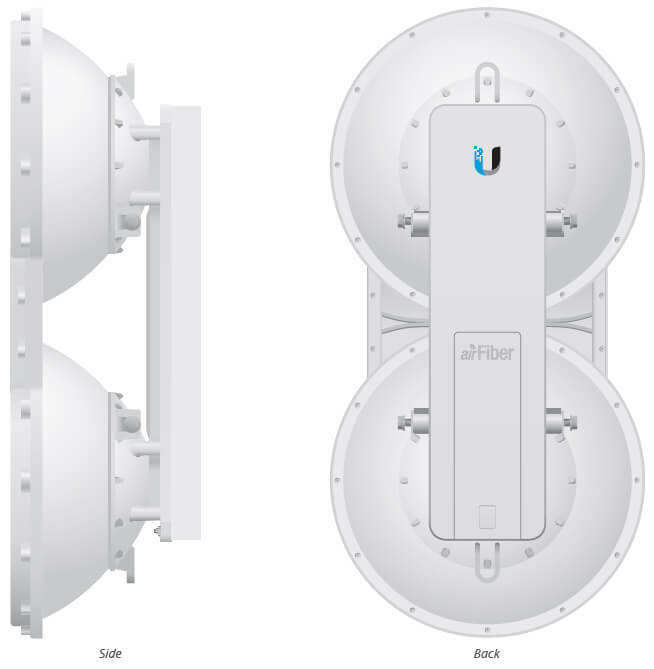 Download the Ubiquiti airFiber Datasheet (PDF). 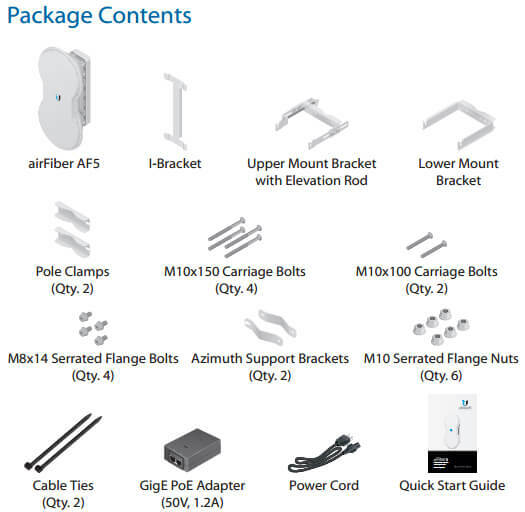 Download the Ubiquiti airFiber5 Design Guide Datasheet (PDF).